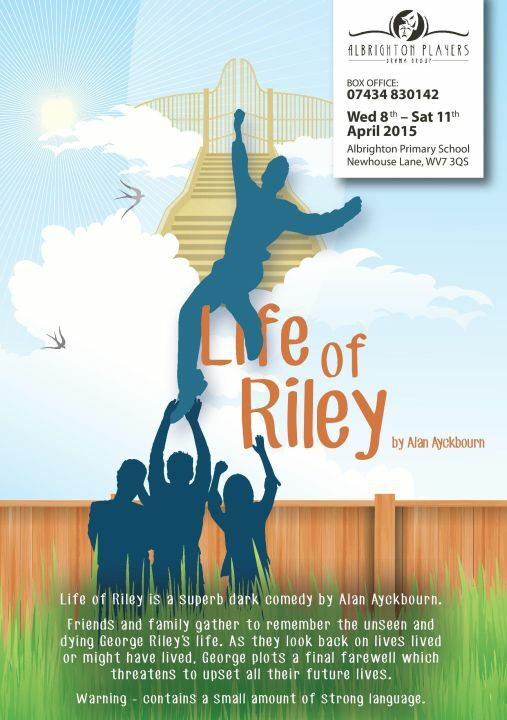 Albrighton Players are happy to announce that tickets are on sale for Life of Riley by Alan Ayckbourn. We are performing at Albrighton Primary School from Wednesday 8th April until Saturday 11th April 2015. Tickets are £8 for adults and £7 for concessions. However for the price conscious we have our “Opening Night Special” where all tickets are just £6! As this play is in the round it is best to book early to bag yourself a good seat! This is a superb play full of dark humour. With a few months of his life remaining, George Riley’s closest friends remember with love, nostalgia or occasional bursts of fury, how deeply he has affected all their past lives. George, though, is plotting one last final farewell which threatens to upset all their future lives. What exactly is the eccentric maverick Riley playing at? This play is a huge challenge for us as we will presenting it “in the round” for only the second time in our history. Playing in the round puts you right in the middle of the action, especially important with plays such as this, which rely on subtle performances in an intimate environment. You can buy tickets direct from ticketsource. If you prefer you can email us on our contact page, ring our ticketline on 07434830142 or go direct to Home Furnishings, The Old Ballroom, Station road, Albrighton and buy them there. Any tickets left for the opening night please and at what time does it start?